Machine learning, the field of applying neural networks to data analysis, unites a range of issues from technological to societal. And audio and music are very much at the center of the transformative effects of these technologies. Commonly dubbed (partly inaccurately) “artificial intelligence,” they suggest a relationship between humans and machines, individuals and larger state and corporate structures, far beyond what has existed traditionally. And that change has gone from far-off science fiction to a reality that’s very present in our homes, our lives, and of course the smartphones in our pockets. 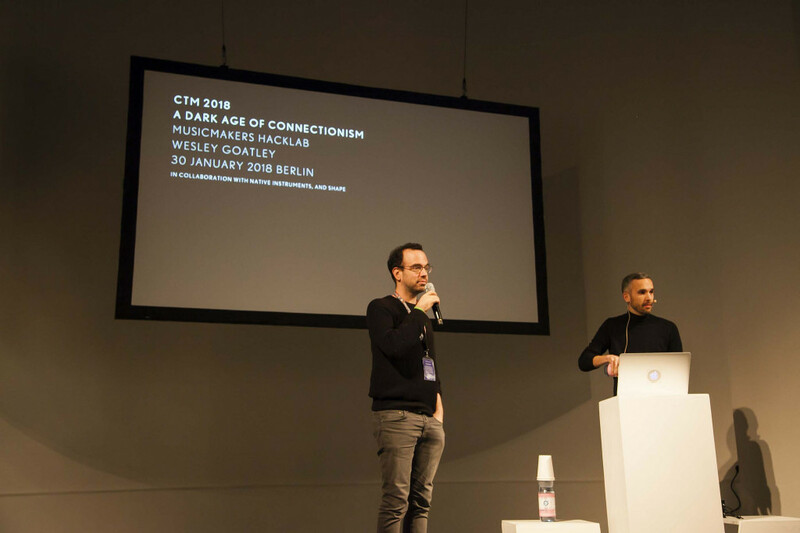 I had the chance to co-curate with CTM Festival a day of inputs from a range of thinkers and artist/curators earlier this year. Working with my co-host, artist and researcher Ioann Maria, we packed a day full of ideas and futures both enticing and terrifying. We’ve got that full afternoon, even including audience discussion, online for you to soak in. Me, with Moritz, pondering the future. 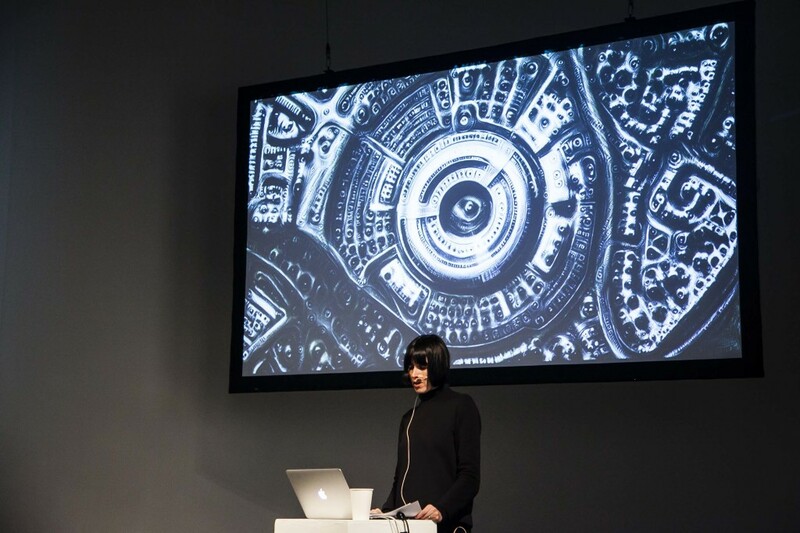 Photo: CTM Festival / Isla Kriss. And there are tons of surprises. There are various terrifying dystopias, with some well-reasoned arguments for why they might actually come to fruition (or evidence demonstrating these scenarios are already in progress). There are more hopeful visions of how to get ethics, and humans, back in the loop. There are surveys of artistic responses. 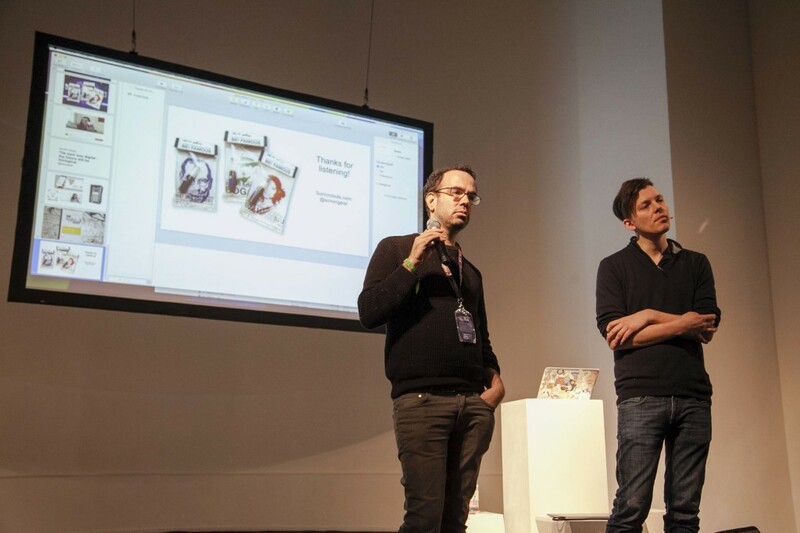 All of this kicked off our MusicMakers Hacklab at CTM Festival, which set a group of invited artists on collaborative, improvisatory explorations of these same technologies as applied to performance. These imaginative and speculative possibilities become not just idle thoughts, but entertaining and necessary explorations of what might be soon. This is the Ghost of Christmas Yet-to-Come, if a whole lot more fun to watch, here not just to scare us, but to spur us into action and invention. Let’s have a look at our four speakers. 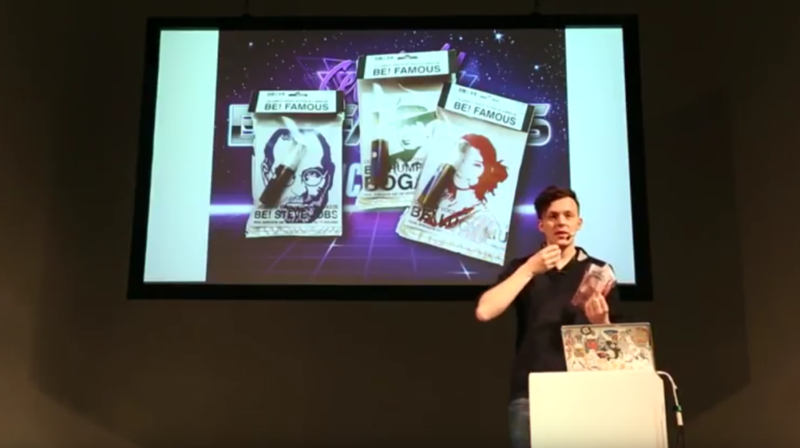 Who he is: Moritz is an artist and researcher; he joined us for my first-ever event for CTM Festival with a giant robotic 808, but he’s just at adept in researching history and future. Takeaways: Moritz gives a strong introduction to style transfer and other machine learning techniques, then jumps into speculating on where these could go in the future. In this future, remixes and styles and timbres might all become separate from a more fluid creativity – but that might, in turn, dissolve artistic value. 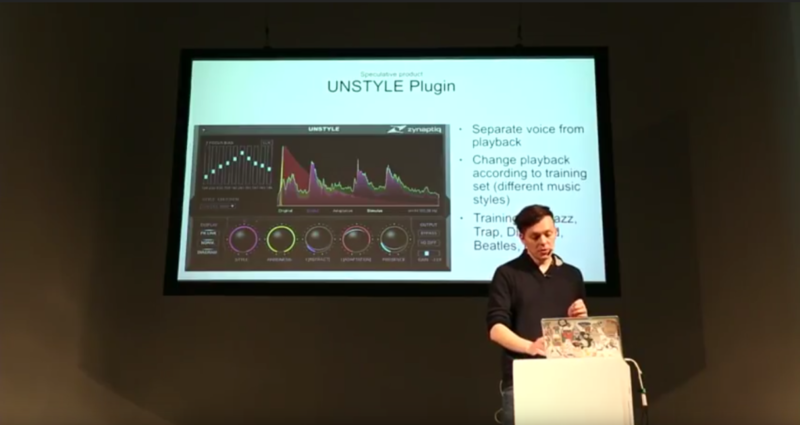 Moritz imagines an “UNSTYLE” plug-in that can extract vocals – then change genre. What if self-transformation – or even fame – were in a pill? 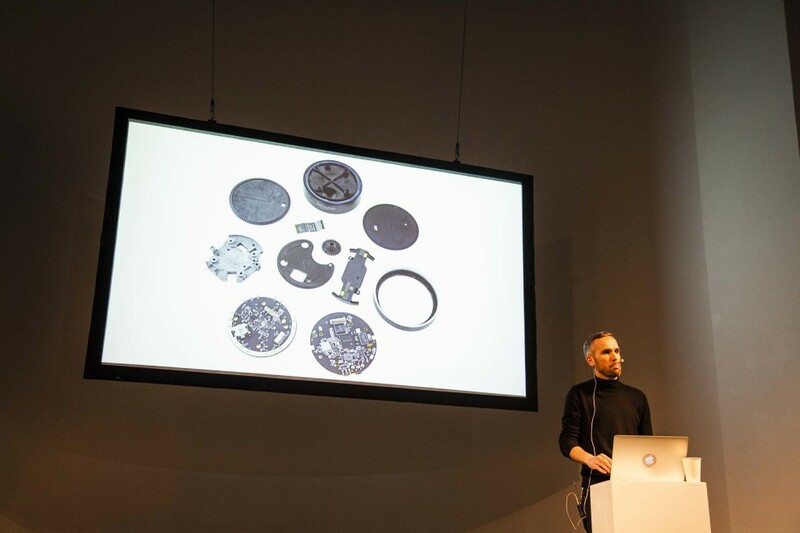 Who he is: An artist/technologist who works with generative systems and its overlap with creativity and expression. Don’t miss Gene’s expansive open source resource for code and learning, machine learning for artists. 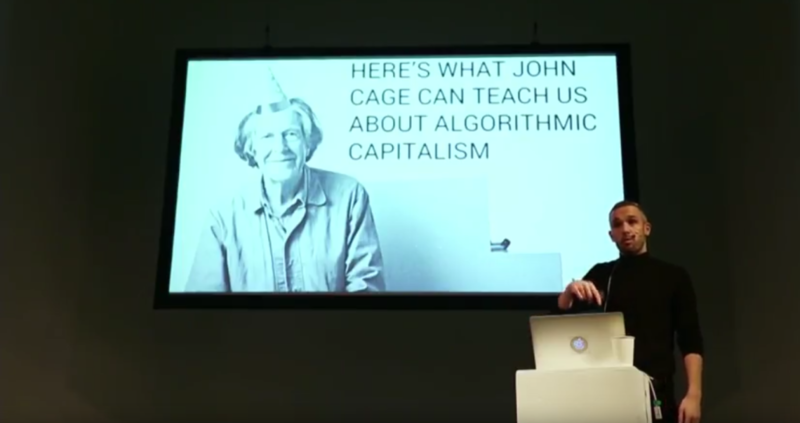 Takeaways: Gene’s talk begin with “automation of songwriting, production, and curation” as a topic – but tilted enough toward dystopia that he changed the title. In a more hopeful vision, he presented the latest work of Snyderphonics – instruments that train themselves as musicians play, rather than only the other way around. 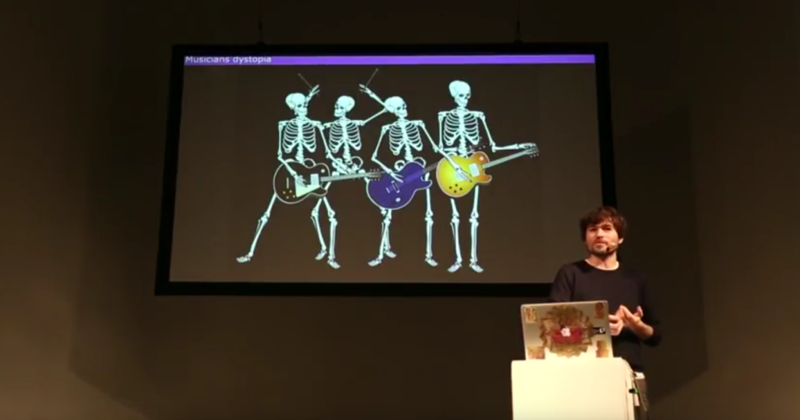 Gene presents – the death of the human musician. Takeaways: Wesley began with “capitalism at machine-to-machine speeds,” then led to ways this informed systems that, hidden away from criticism, can enforce bias and power. In particular, he pitted claims like “it’s not minority report – it’s science; it’s math!” against the realities of how these systems were built – by whom, for whom, and with what reason. Wesley on dark connectionism, from economics to design. Photo: CTM Festival / Isla Kriss. 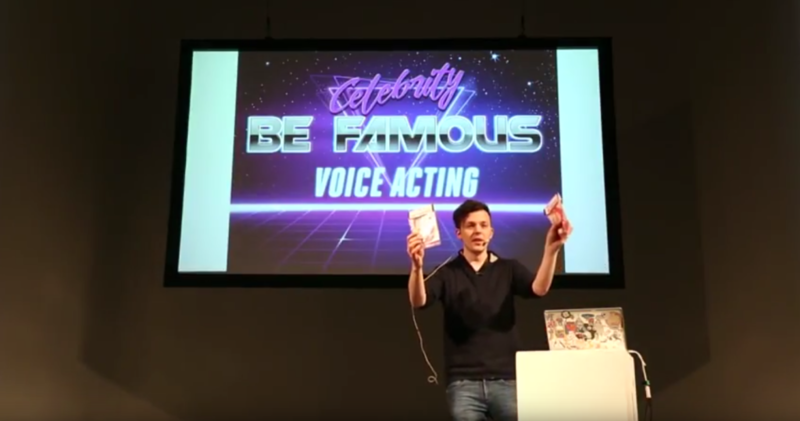 Deconstructing an Amazon Echo – and data and AI as echo chamber. Photo: CTM Festival / Isla Kriss. What John Cage can teach us: silence is never neutral, and neither is data. Who she is: Estela is a creative director / curator / digital consultant, an anchor of London’s digital art scene, with work on Alpha-ville Festival, a residency at Somerset House, and her new Clon project. Topics: Digital art responding to these topics, in hopeful and speculative and critical ways – and a conclusion to the dystopian warnings woven through the afternoon. Takeaways: Estela grounded the conclusion of our afternoon in a set of examples from across digital arts disciplines and perspectives, showing how AI is seen by artists. Estela Oliva, framed by Memo Akten’s work. Photo: CTM Festival / Isla Kriss. It was really a pleasure to put this together. There’s obviously a deep set of topics here, and ones I know we need to continue to cover. Let us know your thoughts – and we’re always glad to share in your research, artwork, and ideas. Thanks to CTM Festival for hosting us.